A North Korean delegation led by a controversial general has crossed into South Korea for the Winter Olympics closing ceremony in Pyeongchang. Gen Kim Yong-chol is blamed for the torpedoing of a South Korean warship in 2010, with the loss of 46 seamen. Pyongyang denies any involvement. 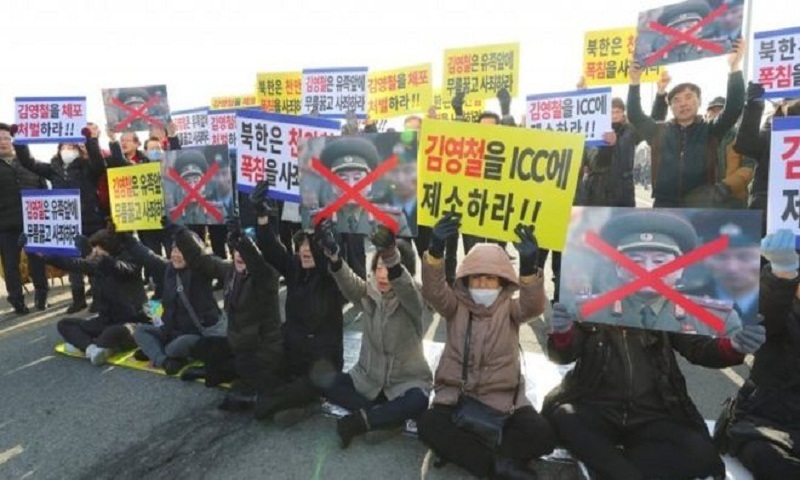 Families of the victims and South Korean conservative MPs held a protest, trying to block his trip at the border. The sports diplomacy comes at a time of improved ties between the two Koreas. At the Winter Olympics, both North and South Korea marched under one flag at the opening ceremony, and later fielded a unified women's ice hockey team. However, experts have cautioned that the latest developments do not put an end to underlying regional tensions, particularly following last year's nuclear and missile tests carried out by the North. The US delegation at the Olympics - which includes President Donald Trump's daughter Ivanka - has ruled out meeting the North Korean officials. On Friday, Washington announced a set of fresh sanctions against the North. The Korean peninsula has been divided since the 1950-53 war and the two sides have never signed a peace treaty. The 72-year-old is a former military intelligence chief. He is leading the eight-member North Korean delegation to the Olympic closing ceremony later on Sunday. During his time in office, Gen Kim was accused of orchestrating attacks on the Cheonan warship and Yeonpyeong Island in 2010. He was also linked to a cyber-attack on Sony Pictures in 2014 in a bid to block the release of The Interview, a comedy film based on the North Korean regime. Gen Kim rose to prominence as Pyongyang's chief military negotiator during inter-Korean talks, between 2006 and 2008. He later served as the director of the General Reconnaissance Bureau, tasked with cyber-warfare and gathering foreign intelligence, from 2009 to 2016. In 2016, he took charge of the United Front Department, the civilian intelligence agency which supposedly operates pro-North Korean groups in South Korea and handles inter-Korean affairs. Isn't the general under sanctions? Yes. Washington imposed sanctions on Gen Kim in 2010 and 2015, and Seoul did the same in 2016. However, South Korea's Unification Minister Cho Myoung-gyon has clarified that there are no restrictions on his travel to the Olympics. Despite conservative protests, the South Korean government has welcomed his visit, and South Korean President Moon Jae-in is expected to meet the delegation.